Improvements in power, performance and area are much more difficult to achieve, but solutions are coming into focus. Activity surrounding the 5nm manufacturing process node is quickly ramping, creating a better picture of the myriad and increasingly complex design issues that must be overcome. Progress at each new node after 28nm has required an increasingly tight partnership between the foundries, which are developing new processes and rule decks, along with EDA and IP vendors, which are adding tools, methodologies, and pre-developed blocks to make all of this work. But 5nm adds some new twists, including the insertion of EUV lithography for more critical layers, and more physical and electrical effects that could affect everything from signal integrity and yield to aging and reliability after manufacturing. At 5nm, IR drop and electromigration issues are almost be impossible to resolve if this interaction has not been properly accounted for from the beginning. The migration to each new node below 10/7nm is becoming much more difficult, time-consuming and expensive. In addition to the physical issues, there are changes in methodology and even the assumptions that engeers need to make. Many of these technology and design issues have been getting worse for several nodes. The EDA ecosystem is heavily investing in continuous PPA optimization and tightening correlation through the integration of multiple common engines. One example is combining IR drop impacts with static timing analysis (STA) to manage the increasing risks inherent in using traditional margining approaches at 5nm, Lowe said. Other changes may be required, as well. Mark Richards, marketing manager for the design group at Synopsys, noted that 5nm is still immature, with various foundries at different points in their development plans and execution. “Outside of the main foundry players, which are aggressively moving to deliver a production ready flow in a very short timeframe, research is being conducted on new architectures for transistors, because to some degree the finFET is being stretched to its limit toward the 5nm node,” Richards said. “This is why there is somewhat of a tailing off in top-line performance benefits, as reported by the foundries themselves. As you deploy fin-depopulation to meet area shrink goals, this necessitates an increase in the height of the fin to mitigate the intrinsic drive reduction. That brings intrinsic capacitance issues and charging and discharging those capacitances is problematic from a performance perspective,” he explained. 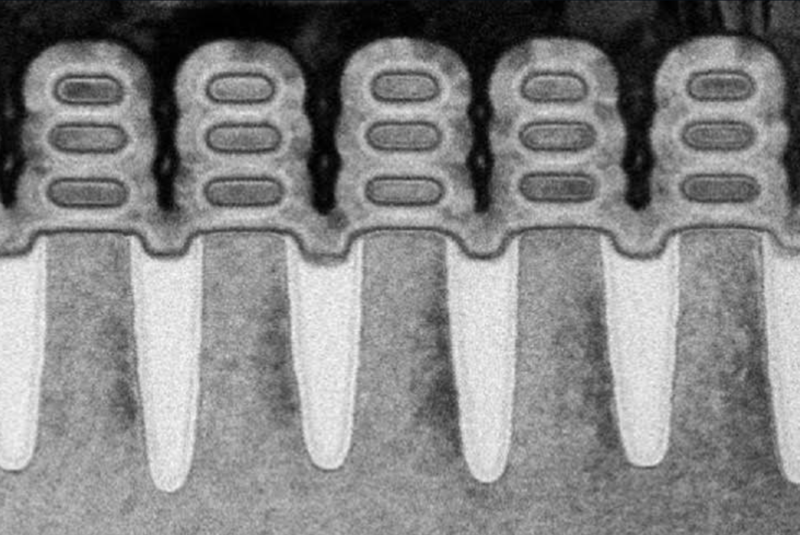 Samsung and GlobalFoundries have announced plans to move to nanosheet FETs at 3nm, and TSMC is looking at nanosheet FETs and nanowires at that node. All of those are gate-all-around FETs, which are needed to reduce gate leakage beyond 5nm. There also are a number of nodelets, or stepping-stone nodes along the way, which reduce the impact of migrating to entirely new technologies. For any new process node, tremendous investment is required by the EDA and IP community to make sure tools, libraries and IP are aligned with the new technical specifications and capabilities. Part of this is the process design kit that design teams must adhere to for that new node. Another consideration many semiconductor companies are currently facing is not to migrate to the next node, or at least not so quickly, or whether to move in completely different directions. Others are expected to stay the course, at least for now. The key metrics are always performance, power and area, and the tradeoffs between all of those are becoming more difficult. Increasing performance brings a subsequent increase in dynamic power, which makes IR drop more challenging. That requires more time to be spent tuning the power grid so designs can deliver enough power, but not kill the design routability along the way. At the same time, the margin between the threshold and the operating voltages is now so small at 5nm that extra analysis is a must. TSMC and Samsung both have mentioned extreme low-Vt cells, which are paramount for really pushing performance at 5nm, where the threshold and operating voltage very close together. Indeed, with the move to 7nm and 5nm, the trends are clear: increasing frequencies, tighter margins, denser integrated circuits, and new devices and materials, stressed Magdy Ababir, vice president of marketing at Helic. He noted during the recent Design Automation Conference, a panel discussed and debated such concepts as: where and when should full electromagnetic (EM) verification be included; whether ignoring magnetic effects leads to more silicon failures during development; whether the methodology of applying best practices to avoid EM coupling and skipping the tedious EM verification part should still be a valid practice; if this methodology is scalable to 5nm integrated circuits and below; if the dense matricies resulting from inductive coupling and difficulty of simulations are the main reason why industry did not widely adopt full EM simulations; and what can be done in-terms of tool development, education, and research to lower the barrier for industry to adopt full EM simulation. “The panel members all agreed strongly that the full EM analysis is becoming fundamental in at least some key parts of any cutting-edge chip. A panelist from Synopsys was of the opinion that is needed in some key places in a chip such as clocking, wide data busses, and power distribution, but not yet in mainstream digital design. An Intel panelist was of the opinion that for current chips, applying best practices and skipping using full EM simulations still works, however this methodology will not scale into the future. A panelist from Nvidia simply stated that EM simulations is a must with his very high frequency SERDES designs, and a panelist from Helic agreed strongly here, and showed examples of unexpected EM coupling causing failures in key chips. The moderator was of the opinion that magnetic effects are already there strongly and have been very significant in integrated circuits for a while, but the difficulty of including magnetic effects into simulation, and manipulating very large and dense matrices resulting from inductive coupling is the main reason full EM verification is not mainstream yet. Everyone agreed that not including EM effects in verification results in overdesign at best and potential failures,” Abadir offered. In the end, the panel agreed that there is a need for significant improvement of tools that handle EM verification, better understanding of magnetic effects, and significant research on how to protect against EM failures or even adopt designs that benefit from magnetic effects. The panel also agreed that current trends of higher frequencies, denser circuits, and scaling of devices combined with the exploding penalty on a chip failure, makes including full EM verification imperative, he added. An additional challenge at 5nm is the accuracy of waveform propagation. Waveform propagation is notoriously expensive from a runtime perspective, and as a result needs to be captured throughout the entire design flow. Otherwise, the surprise at sign-off would be that the design is too big to close. The typical way to solve these problems is by adding margin into the design. But margining has become an increasingly thorny issue ever since the advent of finFETs, because dimensions are so small that extra circuitry reduces the PPA benefits of scaling. So rather than just adding margin, design teams are being forced to adhere to foundry models and rules much more closely. At 5nm, both the global plus the local variation must be considered, because they are incremental. More than ever, 5nm brings together a range of new challenges. “When you think about the billions of components sitting on that chip, it explains why the size of the teams needed to build these chips is now increasing as you flip from one generation to the next. It’s all these challenges that are coming our way. These problems are going to remain, where people will come up with techniques to resolve them and just continue business as usual. Engineering is really that art of building stuff that will work reliably all the time,” Sabharwal said. Tech Talk: How to improve confidence that designs will work properly in less time. Total number of rules is exploding, but that’s only part of the problem. At future nodes there are some unexpected behaviors. What to do about them isn’t always clear.